To Love a Rose: Med Cycle #3 - The Plan, Stan! Talked with J, Dr. S's nurse (she's soooo nice) today; and we got some things on the books for this cycle. I didn't take the time to update you guys, but I got my six-month pap and colposcopy results back last week (following up after my LEEP back in September); and the results showed more abnormal cells on my cervix. *le sigh* The good news is that they're NOT pre-cancer this time, just abnormal. So, thank you GOD for that! Because my regular OB is partners with our fertility doc, he said just to leave it till September when (if I'm not pg) we will probably have to stop TTC to do either another LEEP or freeze my cervix. My sister, W, had this done (the freezing of the cervix); and it sucked majorly!!!! Plus, it would mean we'd have to stop TTC for a while. NOT wanting that to happen! SOOOO, we're pushing to make this work NOW. 1. Estradiol makes me super twitchy; which makes me nervous; which just in general freaks me out. 2. When I trigger, my progesterone levels are kinda crappy. I want to know why this is. "They" say that to support pregnancy, you need a progesterone level of at least 15 or above, but mine have both been just 14. Ideally, for pregnancy, you'd like it in the 30's to into the 80's. I want, no NEED, to get mine there! Also, the first time my levels were 14, I was put on progesterone support (Prometrium), this time I wasn't...why??? 3. I was super, SUPER jittery and twitchy and spazzy this time when my period started. Why? I got so light-headed on at least 3 occasions that I had to literally lie on the ground right where I was. It freaked me out. When you have a catamenial epileptic for a sister and you start sharing her symptoms, trust me, you FREAK out! 4. How would IUI benefit us when we have no male factor IF? I've heard it can still help get the "boys" past the cervix, and that it can especially help if the woman's CF doesn't exactly "love" the man's sperm (we have not done a "post-coital" to find out if this applies to us or not). So, we've got a big decision to make here. Jump right into IUI, or wait one more cycle? On Thursday morning, bright and early at 7 a.m., I'm having an HSG (hysterosalpingogram) to see if my tubes are open or if there is a possibility of blockage. My doc says that this procedure cannot actually diagnose endometriosis, but it can certainly tell if there is the possibility of it (the tubes will either be clear or obstructed by "something"). An HSG uses a special dye which floods the uterus and goes through the tubes. 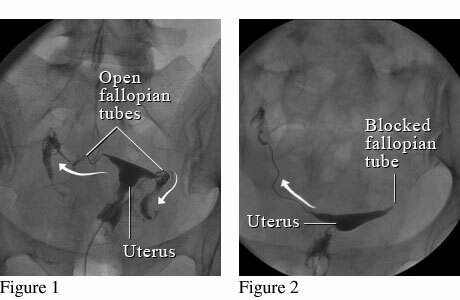 If the tubes are clear, then the dye flows easily into the fallopian tubes and spills out the ends. If the tubes are not clear, then the dye will not flow into the tubes and spill out the other side. I'm seriously hoping that there's nothing wrong with my tubes, but I also know that if there is a blockage we have no chance of getting pregnant without it being removed. The "picture" (actually a type of x-ray) on the left, shows the dye spilling out of the ends of a "clear" set of fallopian tubes. The picture on the right shows how one of the tubes (on the right) is blocked (no spillage of dye out of the end of the tube). This is the exact diagram my doctor gave me to explain how the HSG works. I can use all of the prayers and hopes and good thoughts I can get! I am hoping hoping hoping for this cycle to be "the one" - Mr. C and I both are. If my tubes are open, it would be great news; not just because they're open, but because an HSG is proven to increase chances of fertility slightly for the next 3 months. Woo! I'll take what I can get! I've been very open on this journey, and I thank all of you who have commented or contacted me and wished me well. I really appreciate it all! And, I appreciate the fact that you are all letting me vent these rough emotions that naturally come with IF (infertility). I know it's my blog, and I can write what I want; but it's also nice to know that even when I write honestly, I'm in no danger of being torn down or chastised by readers. So, thanks to you all for being so supportive; I truly appreciate it! I had the same test when we were going through it. It revealed that my tubes were open, but that I had uterine fibroids & polyps. If it helps you any, it was an easy proceedure. They gave me two shots (that made me sleepy an let me lay there for 1/2 hr. to let them kick in. Then the whole thing took less than 15 minutes. I so hope you get great news! Jeff & I were considering IUI as well but it turned out we didn't need to make that decision because, against all odds, we got pregnant the month before (and that was with some known issues on his side). I can't say I totally understand what you're going through because each of us is unique in our situations and personalities, but I do know that sense of hopelessness and hoping-against-hope that goes with the journey. It seemed like EVERYONE else was getting pregnant so easily and, while I was genuinely happy for my friends, it was still difficult wondering if I was ever going to get to experience it all. Then MTV goes and shows things like "16 and Pregnant" and that would just floor me. How were these irresponsible teens, most of who couldn't even stay in a relationship let alone take care of a baby, getting pregnant and I couldn't when I was in a great marriage & could provide a stable and loving home? I know these are the sorts of thoughts that are easy to let run around your head and heart. I do love how open and honest you are about where you're at. This very blog might exist because it's meant to reach out and help somebody (or many people), somewhere, someday if it's not already doing so. Chin up friend! God loves YOU and knows the desires of YOUR heart. He also knows the bigger picture. I hope that is revealed to you very soon. Love you! Just wondering, how long did it take you to get pg after the HSG? My doctor tells me there is a chance of increased fertility for about three months after one is performed (part of the reason we're doing it). So, I just wondered if you happened to get pg in that time span after yours? I think you can totally understand where I'm coming from! And, I know exactly what you mean about being happy for friends yet sad for yourself. It's nearly impossible to explain the over-whelming and simultaneous feelings of JOY and SADNESS you feel when someone you love gets pg when you're struggling to do the same. I've realized that there is noting to be done about it. I'm going to feel both ways. It's not going to be easy. I've had people contact me and say, "Wow, I'm going through the same thing." Or "It's so hurtful going through this, here's my story." I'm shocked at how many women are struggling out there with so much worse than myself; it's been a very humbling and eye-opening journey. I KNOW God has a plan. I'm trying so very hard to not get knocked down by the day-to-day, but to keep my hope alive through his promises of joy and fulfillment. I know one day it will be "my turn"...one day. Thanks for your encouragement! Love and Hugs to you, my friend! I'll have to go back and figure out exactly when it was. I think it was late March for the test and then I had the surgery late May. I got pregnant mid-June so it was at the end of the 3 month window (this was after 3 years of struggling with infertility and really only about 6 months after we finally found and went to a good fertility specialist who actually did these kinds of tests to determine what was actually causing the problems). I've been really surprised at how many people close to me have or are currently having problems TTC. It touches more people than I thought it did. That's why I'm an open book about it and I'm so glad you are willing to be as well. I think the good that comes out of it is that you can be equipped to help people you might never have been able to before. Wow, sounds like the surgery really helped your chances out! :-) Good news for someone like me! Yes, I know what you mean. So many women have come out of the wood-work to let me know that they too struggled with TTC. It's such a heart-breaking journey for so many, but more often than not there's a happy ending! I am so encouraged and humbled by the grace and strength these women show. Sure, I know they all had/have their bad days; but when it comes down to it, they fight hard and trust God so completely. I have been so inspired by their faith. This experience has definitely altered my heart for God!